We are go to get a Pineapple Punch tonight. What? We are getting lots of moisture from Hawaii so it means Snow tonight. 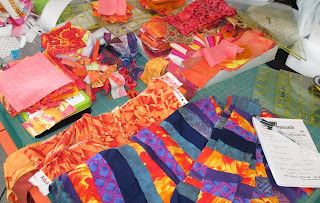 The bright Orange scraps make me think of the bright colours of Hawaii. Orange is the new colour for the Rainbow Scrap Challenge 2013. 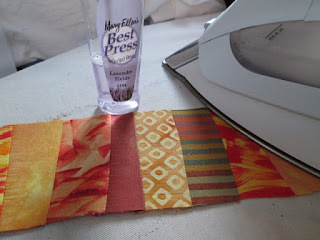 I have added my post to Scraphappy Saturday Orange Oasis today. 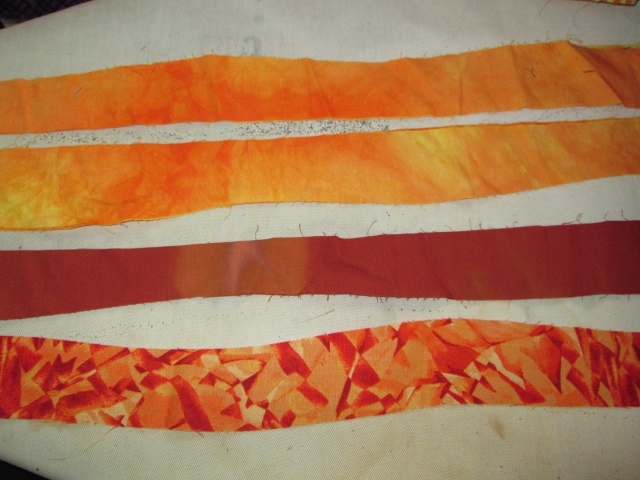 After you read my post, Go see what others are doing with their orange scraps. I sewed on my "Around About" last night. I needed to get from purple to Orange. Last month I was lucky to find an old strip set of pink and purple to make the change over. How was I going to make my change from Purple to Orange? Why would anyone have purple and orange left overs partly sewn? Well I dug and dug. Guess what I found? (it helped that I cleaned and took note of old UFO's last weekend). Orange scraps, list of blocks I need to do and little piles of units needed. 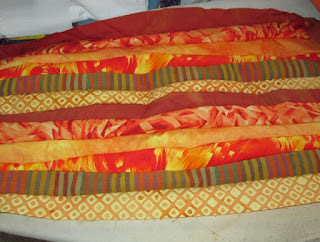 I found this Purple and Orange lumpy wavy strip set. It was built in a Nancy Crow class maybe back in 2004 or 2005. I have a box of curvy strip sets I built in the class. I spent at least one full day (and night) building about 12 strip sets that are very wonky and measure about 20 inches across. This was one of them. Perfect. Finally using it. With the strip sets I have some more curvy cut strings. Many in orange. See how wavy they are. They were cut with a rotary cutter but not a ruler. I sewed some together. Do you see how lumpy it is. I do not iron it yet. Cut it first. Cut before you iron. I made it wide so that after it is ironed I can straighten it up again. I am not sure I want "Around About" to be totally wonky. Just a few bits here and there. I used best press and a very hot dry iron to make those seams behave. It worked. I then trimmed these again to get out edges to be some what straight. I did not want to get into fussy curves on the larger units I am adding. I have been interviewing each of the add on before I sew it on. 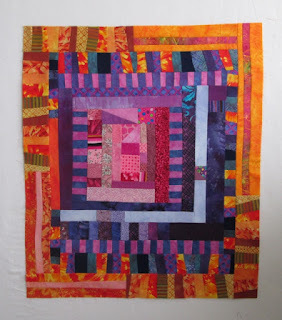 This is the photo before I sewed and in the stage were I thought "Yes I am happy with it". You are so creative - a real artist! Your punch is absolutly delicious! Just yummy. That's pretty wild! I'm not wild about wild but strangely enough, I like it. So, if I get this right...your "Round About" is going to use all the RSC 2013 colors beginning to end? 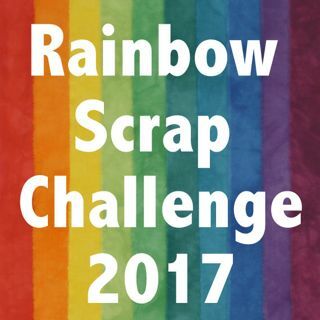 What a challenge that will be! 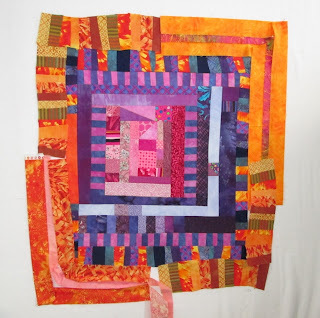 I very much love the look of that quilt. It's so....so.....YES. It is very yes. It is one of those serendipitous happinesses that make you smile because you know it is right in almost every way. Love that "Around About", it was very fortunate that you had done that inventory of UFO's and could access the perfect pieces. Look forward to might get added to it next month. How original and wonderfully wild. How lucky to have kept and found such treasures. I really like how Around About is looking - very fresh! And thanks for the tutorial on using wavy strips - I will have to try it! Cathy, I just love what you are doing here. I want to try this idea. Such a fun idea...I just love how it's going! Wonderful art project, can't wait to see the finished quilt. What a fun collection you have going so far. It will be interesting to see how long you can keep it going. I love your Round About...I with Jamie, I can't wait to see how you are going to finish this one.. love it so far. Love how this quilt is coming along!